There is something about this time of year that makes me feel like the laziest potato. Maybe because it’s still dark and foggy when I wake up, or the days are getting shorter and shorter, or maybe it is the fact that we have a new comfy couch that feels like it’s constantly hugging you. Whatever it is, my desire to sit around all day being a blanket burrito watching 90 Day Fiancé for hours on end is at an all time high. Have you watched that show by the way? Or 90 Day Fiancé Before the 90 Days?! It is the trashiest of trashy TV but we’re currently obsessed but also thankful that we met in a totally normal and boring way. If you couldn’t already guess after my declaration of laziness, we do not have any Halloween plans. If anything, I’ll dress up as a nigiri again for work so I don’t get judged for not dressing up. Halloween has always sort of been my least favorite holiday. Is Halloween a holiday? If it’s your favorite day of the year then I’m happy for you! I hope you win the costume contest! For me, Halloween feels like a milestone in the year that we just need to get past so that we can get to the good stuff. THANKSGIVING! CHRISTMAS! Maybe Hanukkah this year! But those are the holidays that really make my heart skip a beat. What I do like about Halloween, other than cute baby costumes, is the candy! Throughout the majority of year I rarely ever indulge in true candy. Yes, I have plenty of cake and baked goods. But there’s almost never a Snickers or bag of Skittles in our apartment. But during Halloween, I can’t help myself when there is a giant plastic cauldron overflowing with sugar sitting in the kitchen at work. I go straight for the Crunch Bars and Cookies N’ Creme Bars. They’ve always been my favorite since I was little, especially the Cookies N’ Creme! If my entire halloween haul was made up of white chocolate goodies I would have been the happiest culturally inaccurate Pocahontas in all of Cleveland! It’s no secret that I’m a white chocolate fan. I’ve gone through my entire life with people telling me that it’s not real chocolate. I hear ya. But it’s just so good and creamy. I’ll be Team White Chocolate for as long as people continue to talk trash about it… which will be forever I’m sure. These white chocolate and spiced pistachio butter cups would have sent me over the moon if one of the fancy houses in the neighborhood were handing them out. I guess you’re not supposed to eat unwrapped candy… BUT the point is that these candies are such a good treat! And sort of bougie (looking), despite the fact that they don’t take much effort to whip together. That’s the magic of crumbled pistachios. 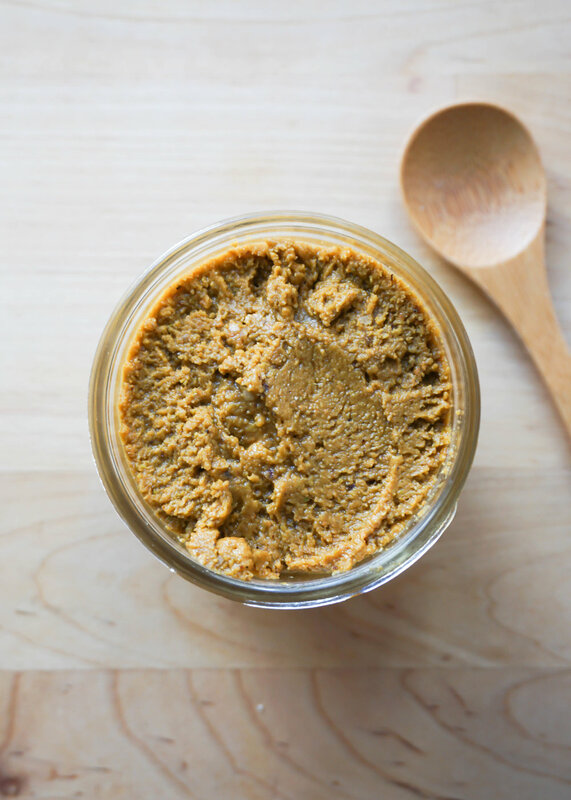 You can use store bought pistachio butter or any other nut butter you like instead of making your own. The additional spices makes it feel V autumnal and cozy. They also freeze super well and can be kept on hand for whenever you feel like transforming into a blanket burrito watching trashy tv snacking on a sweet treat. Hmmmmm how can I make that into a Halloween costume? * if you can only find salted pistachio, just don’t add the extra salt and add a teensy bit more honey. Adjust according to taste. Place pistachios in a food processor. Pulse for 30 seconds until you have fine crumble. Take out 2 tbsp of pistachios and set aside for your topping. Add in salt and pumpkin spice. Continue to blend for 5-7 minutes. Slowly add in honey and olive oil while blending until smooth. Set pistachio butter aside. Melt white chocolate and coconut oil over a double boiler or in the microwave. If melting in the microwave, microwave in 20 second increments and mix in between until melty. This will prevent the chocolate from burning. Allow chocolate to slightly cool for a few minutes. Line a muffin pan with ridged liners. Add in a tablespoon of white chocolate into the liners. Then plop in about 1 tsp of pistachio butter and then fill with more white chocolate until completely covered. Sprinkle a bit of crushed pistachios on top. Place in the freezer until set and enjoy! Hola! Do you know what today is? It’s my birthday! I’ve completed 27 wonderful and sometimes awkward trips around the sun! 27 doesn’t feel too much different than 26. Except last year I distinctly remember that all I wanted to do for my birthday was eat Mac and Cheese all day... and this year all I want to eat all day is vegetables and other green things. I can’t really tell if that is sign of maturity and a stronger awareness of self care or if it’s because we just got back from vacation 2 days ago and we each ate a total of 15 tacos in 3 days. Who knows?! Oh! We just got back from a long weekend in Mexico City! It was so lovely. As I already mentioned, we each ate 15 tacos over the course of the trip. And so many other things! Literally everything we ate was like the best thing I ever ate. I’m going to share a blog post about our whole trip- everything we saw and ate- and share it soon! Hopefully within the next week, otherwise it’s never going to happen. You all should plan your trips to Mexico City now though. Seriously. Such a great place! The colors of the city alone were so inspiring. I’m thinking of making a Mexico City or Luis Barragán inspired cake! I’m imaging blocks of Mexican pink, bold blues, and some creamy neutrals. I’ve gotten very into abstract cake decorating lately if you haven’t noticed. I love it so much because it doesn’t involve painstakingly piping perfect flower (I will attempt that later!) and it’s a stress free way of playing around with forms and color. I wanted this year’s birthday cake to sort of be a self portrait. Last year’s birthday cake was more Reuben focused because was turning the big 30 and had just passed all his architecture licensure exams, so I made the cake look like a concrete column... sort of. But this year the cake is a reflection of me! It has swooshes of warm orange and yellow hues with a little accent of blue. If you want to hyper analyze the design of the cake like we did in college art history, you could say that it’s an expression of my big, colorful, and chaotic moves in life, but the blue accents represent Reuben’s presence in my life and his ability to balance me out. Our something like that lol. It pretty much matches the aesthetics of my life which makes me so incredibly happy. The inside of the cake is a classic chocolate. I realized that all my cakes on Eat Cho Food are vanilla based and I felt like I needed to diversify! It’s really yummy and moist! I got to enjoy the cake scrapes when I first made the cake a week ago, but we finally got to cut into it last night at dinner. Still yummy and moist! I’ll probably have another slice tonight and then another for breakfast tomorrow. Does anyone want a slice of chocolate cake???? * if you don't have buttermilk and only have milk, you can stir 1 cup of regular milk with 1tbsp of white vinegar and allow to sit for 5 minutes until thick. 1. Preheat your oven to 350 degrees. Grease cake pans and line bottom of the pans with rounds of parchment paper. 2. Whisk together the sugar, flour, cocoa, salt, baking powder, and baking soda in a large bowl. Whisk together eggs, buttermilk, vanilla, and vegetable oil in a medium bowl. Add the wet ingredients to the dry ingredients. Mix to combine. Stir in boiling water and mix until smooth. 3. Pour the batter into the cake pans. Lift each pan about 3 inches from your work surface and drop a few times to remove any air bubbles. Bake for 28-30 minutes until done. Test for doneness using the toothpick test Remove from the oven and allow to cool in the pan for 10 minutes. Remove cakes from the pans and allow to completely cool on a wire rack. Place cakes upside down on the rack to help level the cakes. 4. While cakes are cooling make your buttercream. Whisk softened butter with the paddle attachment on your standmixer for 2 minutes on medium speed until light and fluffy. Reduce the speed to medium low and gradually add in powdered sugar. Add in salt, vanilla, and milk and mix on medium until fluffy. Reserve about 1/4 of your buttercream for mixing in colors. If you need more buttercream for decorating add another stick of butter and 1 cup powdered sugar. 5. Once cakes are completely cool, level off your cake layers. Keep cake scrapes for a snack later! Place a small blob of buttercream on a cake round and place a layer of cake on the cake round. Add buttercream, top with another cake layer, and repeat one more time. Frost the whole cake with a thin layer of buttercream to make your crumb coat. Place cake in the freezer for 15 minutes. When crumb coat is solid, add another layer of buttercream until smooth. 6. To decorate in an abstract painting style, mix your remaining buttercream into various colors. I recommend having at least 3-4 colors. Have 2-3 colors within a similar color range and then one additional color in a contrasting bolder color. Apply dabs of colored buttercream to your cake and smear with an offset spatula in various directions and sizes. Decorate to your liking! 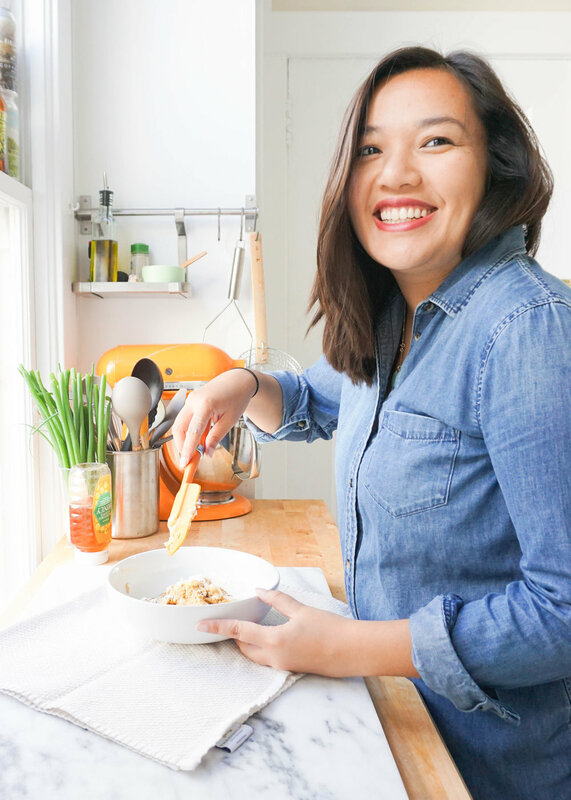 The result is a kitchen diary that combines good cooking, luscious photography and spicy writing to tell the story of a young woman living with her sweetheart in one of San Francisco’s great neighborhoods and spreading love to friends and family in the form of mouthwatering meals and snacks. Eat Cho Food is an on-going journal of happiness. Al hit the nail on the head and I don't think I could have said it better myself... actually, I definitely couldn't have. My goal for this blog is for it to be more than just recipes. I want it to be filled with stories, memories, and thoughts that simply make you happy, even if it's just for a moment during your day. This blog is a product of joy. The world is a pretty messed up place sometimes. So if I can make it just a tiny bit brighter, I feel like I'm doing something good with my life. If you want to read the article check it out here! Alright, so what is a buckeye? The official state tree of Ohio is the Buckeye. The tree produces seeds that look like this. The mascot for The Ohio State University is a buckeye named Brutus. The creative people of Ohio started making peanut butter and chocolate confections to mimic the look of our state tree nut. Everyone in the state of Ohio without a peanut or chocolate allergy eats them. That is the terrible abridged history of the chocolate buckeye! If it wasn't entirely clear, a buckeye is essentially a ball of peanut butter mixed with powdered sugar and then dipped in chocolate. 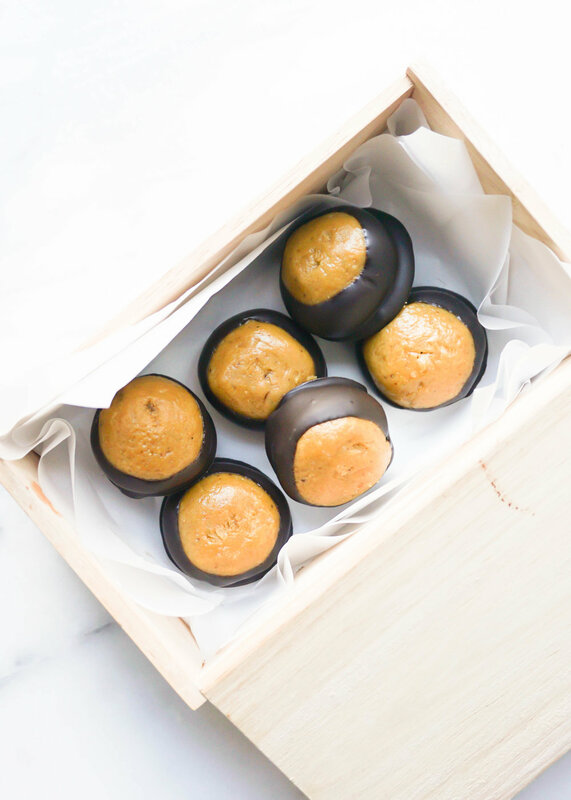 It's a like a peanut butter cup and truffle hybrid... but looks like a buckeye. You get it. It's really hard to explain if you're not from Ohio. I've upgraded the traditional buckeye by making my very own pistachio butter! If you haven't tried pistachio butter yet, you must! Don't buy the jar stuff though. A jar of pistachio butter is like $15!!! Hell. No. Buy a bag of pistachios for $8 at Trader Joe's and grind it up yourself. That way you can control how sweet or chunky you like it. You'll feel super accomplished. I've adjusted this recipe so that it is not "ah! I'm going to get so many cavities" sweet, which is how buckeyes typically are. These actually taste like pistachios and have a bunch of salt in it to counteract the sugar. They make a perfect and cute gift for when one of your best friends shows up for a surprise lunch date, or if you want to do something nice for your nut butter loving girlfriend. If I ever get the opportunity to write a cookbook one day, I definitely want there to be a chapter called "The Homesick Ohioan." There would be buckeyes, pirogies, Skyline coneys, copycat Jeni's ice cream, copycat Steak n' Shake burgers, and more things that my slightly tipsy brain can't think of right now. Doesn't that sound great?! 1. 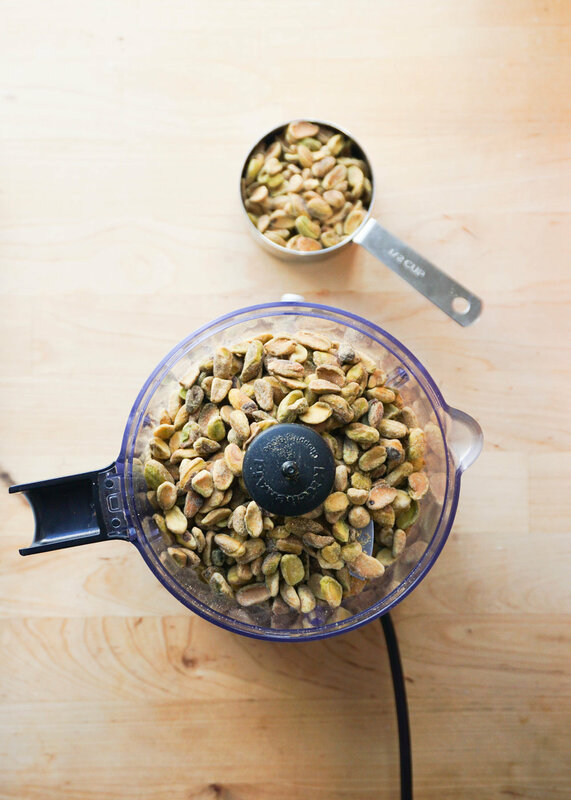 Add roasted pistachios into your food processor and process for 4-5 minutes until it is crumbly and starting to get creamy. Slowly drizzle olive oil and process for another 2 minutes. Add honey and salt. You can adjust depending on taste. Mix for another minute until creamy. You should have about 1 cup of pistachio butter. 2. Combine pistachio butter, melted butter, powder sugar, and salt in a bowl and mix until combined. Add a little more salt to taste if you like. Place bowl in the freezer and let the mixture firm up for 15 minutes. 3. Remove bowl from the freezer. Line a baking sheet with parchment paper. Scoop out about 1 tbsp of the pistachio butter, enough to make a 1" ball. Roll between your hands to form a ball. Place on parchment paper. Repeat until all the pistachio butter is used up. Stick the baking sheet in the freezer and let the balls firm up for 30 mins. 4. Right before you're about to take out balls, melt your chocolate. Either melt your chocolate in a double boiler or in the microwave. If going the microwave route, slowly melt the chocolate by placing it in the microwave in 15 second intervals and mixing in between. It takes awhile, but you have to do this to avoid burning the chocolate. Trust me! 5. Take the balls out of the freezer. Use a toothpick and stick it into a ball and then dip into the melted chocolate. Allow the top portion of the pistachio butter ball to remain exposed to give it it's buckeye appearance. 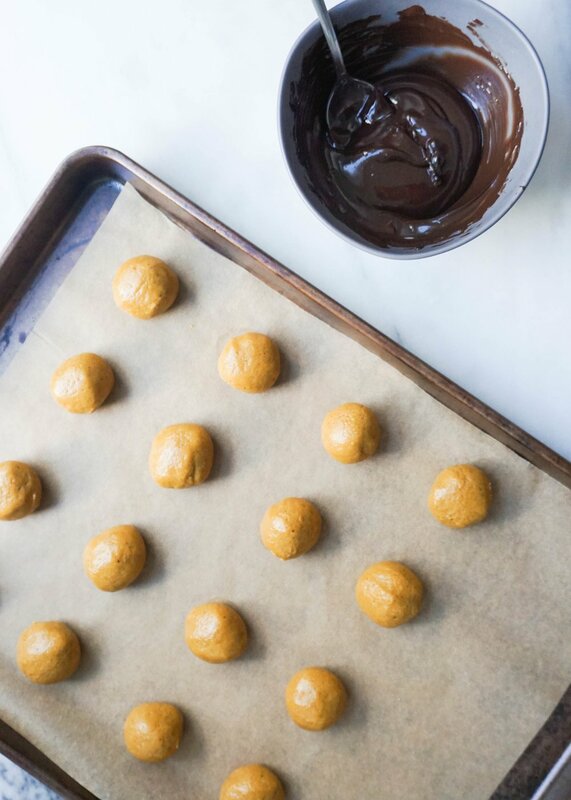 Shake off any excess chocolate and place back on the parchment paper. Repeat with all the pistachio butter balls. Use the back of a spoon or small offset spatula to carefully smooth over the hole from the toothpick. Stick the sheet in the fridge for 15-20 minutes until the chocolate and pistachio butter filling has firmed up. I know Valentine's Day is sort of silly... but I really love all the cute love cards and heart shaped foods that float around this time of year. Reuben and I don't really buy gifts for each other on Valentine's Day, instead we make something edible for each other! Last year I made him homemade everything bagels, which made for super yummy breakfast sandwiches, and he made me an amazing pizza. Reuben literally makes the best pizza. THE BEST. He's been perfecting his recipe for the last 2 years and I think he is ready to go professional. I've asked him if I could share his recipe here but he said no... you might need to buy him a bunch of beer to get that recipe out of him. This year I'm planning on making a lamb dinner, that's all I got at this point... typically something more creative comes to me while I'm wandering around the aisles of Whole Foods. For a sweet treat I've made these white chocolate covered strawberries. For the record, I am definitely on Team White Chocolate. I know I know I know, white chocolate isn't real chocolate. I've heard that about a billion times. It's my favorite and I don't care about the haters. Chocolate covered strawberries make for a great gift for your boo, especially if you've procrastinated and its February 13th and you haven't bought anything yet. These only take about 30 minutes to whip up and won't disappoint. Fun Fact: I actually briefly worked at a chocolate shop in high school. I was getting paid $7 an hour to stock truffles, decorate caramel apples, mix milkshakes, and dip EVERYTHING in chocolate. There was a great perk of taking home any chocolate that fell on the ground (2 second rule?) or a caramel apple that was a little past selling to someone but perfectly fine to still eat. Looking back on my experience there, it was in theory the perfect job for me. My hours were spent making confections but then also convincing people to buy sugar. It's what I do now, but without the $7 an hour. While working there, I learned how to really work with chocolate. Chocolate can burn, did you know that? It can burn really easily too. I loved making the chocolate covered strawberries. It was relaxing and getting that perfect drizzle was really satisfying. I discovered that I have a great wrist for chocolate drizzling! I'm happy to say that I haven't lost my strawberry dipping skills. I've continued making them over the years. Last year when my family was out West visiting me, I forced them to go strawberry picking with me on a farm near Santa Cruz. It was beautiful and a little windy, and they had sweet strawberries and the most amazing scones. 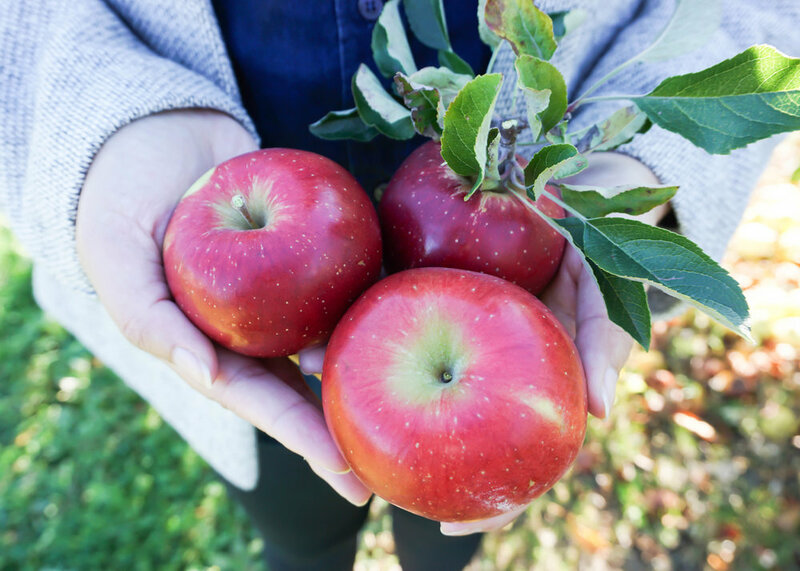 Check out Swanton Berry Farm if you want to go berry picking sometime! We took home an assload of strawberries and covered them in chocolate to treat ourselves to. Alright, Valentine's Day is a day away. You have plenty of time to make these! This recipe uses only white chocolate, but you can easily swap in milk and/or dark chocolate. I added crushed up freeze dried raspberries to naturally color my white chocolate. It adds an extra berry and slightly tart flavor to the chocolate that I'm really into. Good luck and have a lovely love day! Rinse and pat dry your strawberries. Bring a small pot of water to boil OR for Microwave method see note at the bottom. Place chocolate in a bowl that is larger than the mouth of your pot. Once water is boiled, lower heat so that the water simmers. Place bowl of chocolate over the pot to create a double boiler. The chocolate will slowly melt from the hot steam. Use a rubber spatula to slowly mix the chocolate. Chocolate should be smooth and silky after 3-5 minutes. It is ready if the chocolate easily drizzles when you lift the rubber spatula in the air. Divide the chocolate evenly between 2 small bowls. In one bowl mix in the freeze dried raspberries. Take a strawberry and grasp it by the leaves. Dip the strawberry into the chocolate. Shake off any excess chocolate, you want the chocolate to stop running off the strawberry. Place it on the sheet pan to cool and harden. If your chocolate starts to solidify in the process just pop it into the mircowave for 10 seconds. Get creative with decorating! Dip the strawberries into the graham crackers immediately after the chocolate for a cheesecake style. Drizzle in alternating colors for a classic effect. Or do a double dip in each color (let the first layer harden first before the second dip). Let cool and harden. Share with someone you love! * If you are going to microwave your chocolate, microwave in 10 second increments and stir. It will seem like nothing is happening in the beginning but you just have to be patient. Chocolate needs to melt slowly to get the right shine and consistency. After about 60-90 seconds your chocolate should be ready. Be patient!